Raucous hockey player turned golfer Happy Gilmore sends the sedate sport into overdrive after he becomes a media sensation with his outlandish antics on the links. 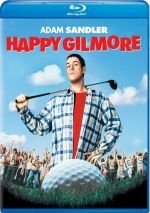 One of the Adam Sandler’s more enduring flicks, I never saw 1996’s Happy Gilmore until I received a 2004 DVD. I liked its predecessor, 1995’s Billy Madison, so I can’t recall why I’d avoid Gilmore. I was pleased to finally check it out then – and again on Blu-ray. The film introduces us to Happy Gilmore (Sandler), a hockey-obsessed guy with a nasty slapshot and a nastier temper. Unfortunately, he can’t do anything else well – Happy can’t skate or handle the puck, so his tryouts for hockey squads lead nowhere. Matters go downhill when his girlfriend Terry (Nancy McClure) leaves him due to his continued failures. In addition, his grandma (Frances Bay) gets tossed out of her home because she failed to pay her taxes. She owes $270,000 and has only 90 days to pay or she’ll lose everything. Happy promises to raise the money. When he gets a challenge to hit a golf ball from the movers who’re taking his grandma’s things, Happy learns he possesses a talent for driving. He swats the heck out of the ball and wins a bet with one of the movers. From there, Happy finds himself involved in a new career as a golfer – and a rivalry with champion Shooter McGavin (Christopher McDonald). While Madison showed Sandler’s wilder side, he presents a somewhat more naturalistic turn as Happy. That probably sounds odd given the general wackiness of his behavior, and it’s definitely a stretch to refer to Happy as a believable personality. Nonetheless, Gilmore’s a more normal personality than Madison, and the movie takes a more realistic tone. It doesn’t include the surreal qualities of its predecessor. Other support helps the movie. We get the wonderful Joe Flaherty in a pivotal role as a heckler, and McDonald makes McGavin a delightfully hissable but still funny villain. Bowen creates a surprisingly low-key love interest, one who seems much more believable than the ultra-hot Bridgette Wilson in Madison. She’s real and attainable, unlike the fantasy teacher played by Wilson. I like the concept of Happy Gilmore and think it has its moments, but I must admit some disappointment with it. The movie enjoys more than a few amusing elements - I guess I just expected it to be more laugh out loud funny along the lines of Madison. 2017 reflection: years after the shoot for Gilmore, Bowen has achieved fame as one of the leads on Modern Family. How is it possible that the 40-something Bowen seen in Family is so much hotter than the 20-something one in Gilmore? She looked awfully dowdy in Gilmore and she’s practically unrecognizable to fans of Family. Happy Gilmore appears in an aspect ratio of approximately 1.85:1 on this Blu-ray Disc. The movie came with a decent but unexceptional transfer. Sharpness looked fine. A bit of softness crept into a few shots, but not enough to really mar the movie. The flick consistently showed fairly good definition and delineation. Jagged edges and shimmering were no problem, but I saw some mild edge haloes. A smattering of specks crept into the presentation at times, but it usually remained fairly clean. Colors worked reasonably well. The flick went with a natural palette, and aided by a lot of exterior daylight shots, these were usually peppy enough, though they could be a little messy at times. Black levels also appeared deep and rich, while shadow detail was appropriately opaque but not too thick. The image lacked consistency but it was satisfactory overall. As usual for a comedy, not a lot of activity marked the DTS-HD MA 5.1 mix. The most exciting moments occurred during the golf sequences. For example, Happy’s drives flew toward the back in a strong manner. Otherwise, the movie mostly stayed with general ambience. It showed a good sense of environment and displayed the material well. Outside of the drives, not much popped up in the surrounds, but they reinforced the action. How did the Blu-ray compare with those of the 2004 DVD? Audio was a little peppier, and visuals showed a bit better definition and clarity. The Blu-ray didn’t blow away the DVD, but it demonstrated improvements. Except for text production notes, the DVD’s extras repeat here. The main attraction comes from a collection of deleted scenes. These last a total of 18 minutes and 36 seconds and consist mostly of small excised tidbits. We get a little more exposition and a couple of fairly substantial scenes appear. In one, we see Happy try unsuccessfully to fire his caddy, and another shows Gilmore on a date with Virginia. We also find a five-minute and seven-second set of outtakes. Billu Madison included some interesting elements in its blooper reel, but this one’s just the standard silliness. I don’t think Happy Gilmore stands as Adam Sandler’s best flick, but it presents more than a few good moments. It enjoys a cool concept and some amusing gags to become generally likable, though not exceptional. The Blu-ray provides fairly good picture and audio along with minor bonus features. The disc gives us an ordinary presentation for a decent movie.